The organ was built in 1900 by the firm Schlag und Söhne from Świdnica (the town in Lower Silesia, located about 60 km). In the place of the old Meinert’s instrument which was made about 1770 and rebuilt also by Schlag in 1876; the well-known organ builders’ workshop of Świdnica inserted the new romantic one with two manuals including 27 voices and pneumatic game and registers tracker. 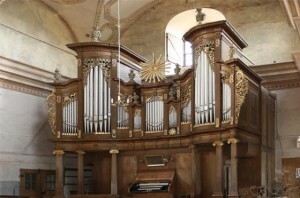 The instrument beholds not only the beauty of the organ prospect founded by Dominic Geyer – the abbot of the Krzeszów abbey and built by Balthasar Rösner and Sigismunt Kretschmer (the workshop of Krzeszów). Most of all its biggest value is the beautiful unique sound of the organ of the late romanticism époque which perfectly matches to acoustics of the temple and belongs to the rare at the moment. This organ has never been rebuilt and its historical colours, despite its technical state that requires immediate rescue of such an inestimable monument of European organ culture, make the unique instrument rarely met today not only among the other organs in Lower Silesia. It was equipped with modern at the time the pneumatic tracker (it is in spite of incorrectly performed maintenance at present wrongly associated) which significantly increases the technical capabilities organist playing on them and the so-called system of fixed combinations, offering the possibility of a smooth transition from the intensity of the sound. Most of the instruments of that period, as a result of German reform “Orgelbewegung” which after 1933 broke with past tradition of organ building and recognized romantic instruments as worthless, and their sound full of expression capable of moving spirit as mismatched to imposed in 1933 the vision of an “objective voice” were destroyed or rebuilt. In Poland, the reform has changed irreversibly sound of historical organs in cities mainly, while in the smaller centers, often because of lack of funding the instruments of this type have been preserved, or even saved. The change in intonation (and the sound as well) of individual organ voices can be compared to repainting of the pictures and these changes cannot be brought back to its original state. 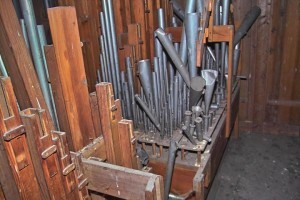 Because the “Orgelbewegung” reform led to the destruction of most romantic instruments in Germany, properly restored organ in Chełmsko Śląskie can become an indispensable and unique didactic tool, with which it is possible to study the organ literature of German Romanticism. In addition, their sound qualities make that it is a piece of art of inestimable value today, not comparable with any instrument being built today. They are equipped with 27 votes (registers) and distributed to three so-called “werks” – two manual keyboards (Hauptwerk and Oberwerk) and the pedal one as well. Their wealth is based on a carefully thought-out conception of sounds, which consists of various colours of tones that are produced in pipes with different menzura (scale length – proportion of height and width of the individual pipes). Thanks to various forms of pipes construction, there was obtained a sound spectrum starting from the very narrow (the group of strings voices, characterized by diverse dynamics and speed of sound – in the organ of Chełmsko Śląskie they are the voices of Violonbass 16 ‘, Violoncello 8 `8` Gamba, Salicional 8 `8` Aeolina and “heavenly voice” Vox coelestis 8 `), through the medium up to a wide (the flute voices that give a full and deep sound). The organ are also equipped with the voices of language (Trombone 16 ‘and Trompete 8 `), the mixed ones and a set of votes on specific design, so that the organist is available to have practically limitless horizon in building and setting up the appropriate colouring of colours. It is also worth mentioning that the instrument in Chełmsko had been equipped with two “sixteen-feet” voices (szesnastostopowe) in both manuals, making it possible to obtain very many passions. After renovation of the organ being properly done, their beauty and uniqueness will undoubtedly attract a group of organists from many centers in Europe and will become a very important point in the cultural map of Poland. In the opinion of many experts the instrument requires immediate conservation and restoration because of the disastrous condition. A lot of the damage have been done by insects, birds, and unfortunately the people as well.